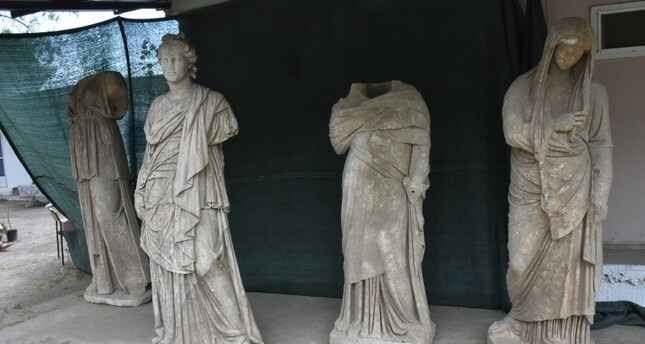 Six statues dating back 2,000 years were discovered Saturday in the ruins of the ancient Greek city of Magnesia, located in southwestern Aydın province's Germencik district. Prof. Orhan Bingöl, who has been overseeing the excavations in the site since 1984, said four female and one male statues were unearthed in the ruins of a temple to Artemis, adding that one of the statues' gender was unknown. Bingöl said all statues were found in the same area and were in good condition of preservation, placed face-down next to each other. "We know that, along with the ones being displayed in Istanbul, Izmir and Aydın, there have been nearly 50 statues unearthed from Magnesia ruins. This discovery will not be the end of it and clearly shows we can find more statues in this particular area," Bingöl said. The first excavations in Magnesia were conducted between 1891 and 1893 by a German archaeological team led by Carl Humann. The work lasted 21 months and partially revealed the theater, the Artemis temple, the agora, the Zeus temple and the prytaneion. Excavations were resumed at the site, after an interval of almost 100 years, in 1984, by Bingöl.